While the idea of starting your baby on tasty foods like peanut butter and eggs might seem exciting, there are a few foods that you will probably want to hold off on. Some foods can have negative effects on young children, from being harsh on their delicate digestive systems to causing the development of food allergies. As a parent, it’s very important to know which foods are safe and unsafe for your child as they grow up. Peanut butter is a kid favorite, and it has a lot of protein, but you should be very careful with not introducing your child to it too early. If your family has a history of nut allergies, it would be a good idea to have an allergy test completed by your child’s pediatrician to make sure that they don’t have the allergy as well; peanut allergies can be very dangerous, especially to young children. If you get confirmation that your child doesn’t have a peanut allergy, you can start them off on smooth peanut butter, a little at a time. Honey is another tasty snack, but children under 1 year of age should never be fed any form of honey. The reason for this is that honey can carry a harmful bacteria known as clostridium botulinum which can cause botulism, muscle paralysis, and other serious illnesses. A baby’s immune system just isn’t strong enough at this point to fight off these bacteria, so the only safe option is to avoid honey altogether. As you likely know, a mother’s breast milk is the absolute best thing for a baby; it has all of the essential nutrients and enzymes that help them grow up healthy. While cow’s milk might be great for older children and adults, under no circumstances should you ever give to to a baby under one year of age. The reason for this is that cow’s milk is difficult for young children to digest, and also because it contains large amounts of protein and minerals which can be harmful to their kidneys. Furthermore, cow’s milk doesn’t have the essential minerals and enzymes needed. If breastfeeding is not an option, baby formula is the next best option. After your child is about one year old, it’s safe to start introducing them to small amounts of milk; you can read our guide on introducing children to cow’s milk. While eggs—in moderation—can be a very healthy food full of protein, vitamins and minerals, they’re not quite suitable for young babies. It is possible for children to develop an egg allergy by being introduced to them at an early age. You are likely safe feeding your baby egg yolks (without the whites) to your child once they start on solids, but be sure to watch for signs of allergic reaction once you do so, such as vomiting, diarrhea, or rashes. Another allergen, it’s recommended that you hold off on feeding your baby anything made with wheat. On the other hand, wheat contains gluten, which is a protein that can be difficult for young children to digest. Again, once you introduce your child to foods that contain wheat, be sure to keep a close eye on signs of allergic reactions, and if you notice anything, notify their pediatrician. On the upside, most children that have a wheat allergy will grow out of it by the time they’re one year old. Yet another possible allergen, seafood and shellfish should be avoided until your child is at least one year old. At this point you can slowly introduce them to small amounts of shellfish or seafoods, like tuna. However, if you or anyone in your family has a seafood allergy, it would be a good idea to talk to your pediatrician about it for an allergy test to make sure everything is okay, first. Strawberries are delicious, and always a favorite when the strawberry season rolls around each year. Furthermore, they’re a great source of vitamin C and antioxidants. Unfortunately, strawberries are quite acidic, making them harsh on the delicate digestive system of a baby, but they’re yet another food that is a possible allergen. Once again, you’ll want to hold off on strawberries until your child is one year old, and be extra careful if your family has a history of strawberry allergy. Chocolate contains caffeine, which you’d never want to give to your young baby. It also has a lot of sugar, which should be eaten in moderation, especially for younger children. If you’re going to feed your baby fruits, actual whole fruit is much better than juices, which often contain added sugar without any nutritional benefit. Also, citric fruit juices like orange and grapefruit juices, are very acidic and can be harsh on a baby’s digestive system. If you do serve your baby fruit juices, you should do so after at least six months of age, and stick to non-acidic juices like apple juice. Diluting it slightly with water is also a good idea when first introducing them to the juice. This covers a wide variety of foods. 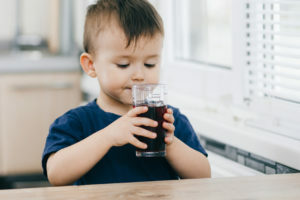 You’ll want to avoid anything that could be a choking hazard, such as large chunks of fruit and vegetables, meat, whole grapes or cherry tomatoes, popcorn, seeds, raisins, or anything similar. You’ll have to use your best judgement, and cut foods into smaller pieces until your child is better at chewing. The list can be longer and longer depends on which blog you are currently reading. It is good to avoid honey, sugar, salt, undercooked eggs, unpasteurized chees, chocolate, sweets, all kinds of sweet drinks, spices, tea, olives, marinades, liver, nuts, low-fat products, products sweetened with sugar substitutes, potato chips, fries, sausage, ham, bacon, pudding, cookies, jellies, ketchup, mayonnais and many, many more (list taken from a guide ‘how to introduce solid foods to your baby’), but some of this products on other blogs are ok like honey and nuts (of course not in a plain form, but used as an ingredient of a meal). I read also that it is good to slowly giving allergenic food to your baby to build a tollerance. Longer you will wait, the risk of food allergy is bigger.